Forget about The Godfather Part ll and The Empire Strikes Back. Sequels rarely work. Errol Morris should have realised that repeating his success with Robert McNamara in the Oscar winning The Fog of War was improbable if not impossible. But you have to give him credit for persuading Donald Rumsfeld to participate in The Unknown Known. Rumsfeld and McNamara held the position of Secretary of Defense during the two most egregious examples of failed US imperialism—the Iraq War and the Vietnam War. The difference is that McNamara had spent nearly 35 years considering what he had done in Vietnam in the 1960s. He was prepared to own up to hard truths and speak his mind to Morris. 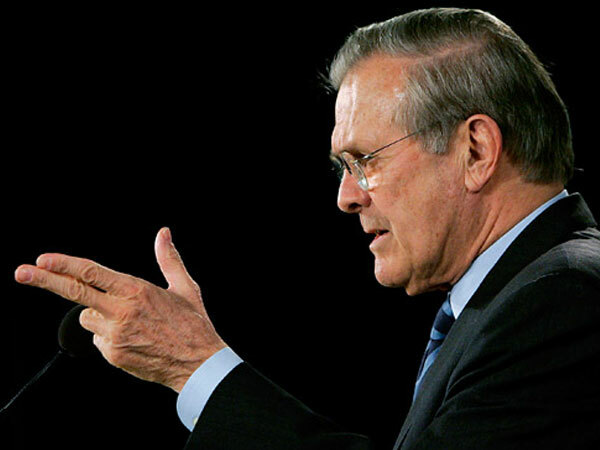 Rumsfeld’s foray into Iraq is of a comparatively recent vintage and he hasn’t admitted to anything. Even repeated visits to Morris’ famous Interrotron—essentially two teleprompters that are connected to cameras—which usually relaxes subjects enough to allow them to admit to potentially shameful things, did nothing to Rumsfeld. Relaxed, he’s just as evasive as ever. Presumably, Morris, who studied philosophy in university and worked for a time as a private detective, thought that he could get Rumsfeld to admit that he thought he knew what the US could achieve in Iraq but “it turns out he (sic) did not.” But Rumsfeld is far too clever to admit something so humiliating to Morris. He simply engages the director in a long-winded debate about language. He finally redefines his phrase: “The unknown knowns—things that you possibly may know that you don’t know you know,” and admits that new definition could be reversed. So much for finding smoking guns! The Unknown Known does show Morris at his most stylish. We see archival footage of Rumsfeld over the decades as he rises and declines in power in Republican circles. Like McNamara, Rumsfeld is often compelling: an intellectual who handles himself with aplomb in every circumstance. But, in the end, all Morris is left with is a visually striking portrait of a man, who has revealed himself to be a sophist. Like Shakespeare, he has discovered that one “can smile and smile and be a villain.” But then that’s a known known.